Andhra Pradesh State Language Pandit Common Entrance Test is a paper-pen based common entrance test directed by the School Education Department for admission to one year Language Pandit Training Course (LPT) in government IASE/CTE's and Private Language Training Colleges in all 23 districts of the state of Andhra Pradesh. The Language Pandit Training Course is offered for qualifications of Telugu Pandit, and Hindi Pandit. The intake capacity in each institute may change from time to time. Age Limit: The candidates should have completed 19 years as on 01.07.2016. There is no upper age limit. Praveen of Dakshina Bharat Hindi Prachar Sabha or Vidwan of Hindi Prachara Sabha, Hyderabad or any other equivalent recognized qualification in Hindi (BA Standard) by the Government of Andhra Pradesh or MA (Hindi). The fee prescribed for appearing for LPCET (including examination fee) is Rs 500/- (Rupees Five hundred only) Candidates can pay the fee through payment Gateway between 02-07-2016 to 11-07-2016 and submit online application at the LPCET website http://lpcetap.cgg.gov.in between 02-07-2016 to 12- 07-2016 . Andhra Pradesh LPCET 2016 Exam Date:- 17-07-2016, Sunday. The common Entrance Examination shall be of completely objective type containing only multiple choice questions. The duration of written examination is Two hours only, with maximum marks of 100 as shown below. AP LPCET 2016 Date:- 17-07-2016, Sunday. 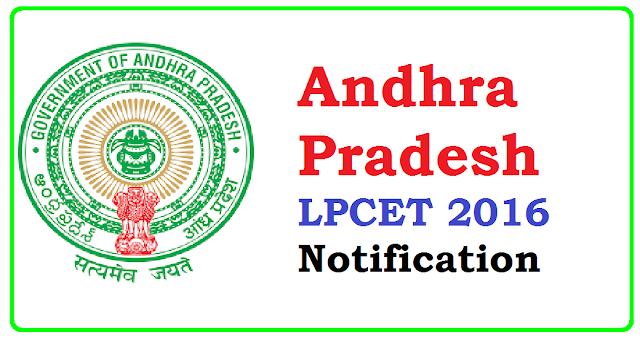 Click Here to download AP LPCET 2015 Information Bulletin.